I love Halloween quilts. I make at least one each year. As far as my fabric stash goes, I have more Halloween themed fabric than any other line of fabric. I just love it. Here is my 2015 Halloween quilt. Finished it last week. It is now hanging on my living room wall. In 2014 I made this quilt for Halloween. I had purchased a panel of Halloween design a couple of years ago. This is the quilt that contains that panel. I put it together in 2014 and even quilted it myself. My sister, Anne, came to visit that same year and liked it so much she took it home. It came back to me this year. I sewing a label on it and now it is in the mail heading back to Anne. I love Halloween quilts! I love the colors. I love the designs of the fabrics that come out. Enjoy, Anne. Dan and Martha were up from southern California over last weekend. We presented their quilt to them all quilted, bound and ready for use. 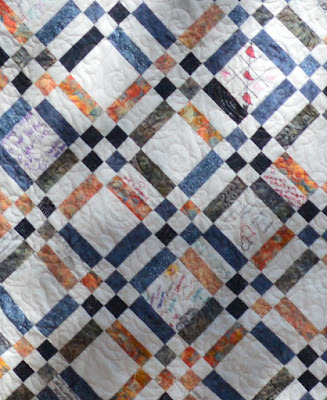 This quilt started as an idea after going to a quilt guild meeting where Peggy Gilbrich came and gave a lecture on History of Signature Quilts. She had many samples there and several of the guild members brought their signature quilts to show to us. I thought what a great way to memorialize an event, such as a wedding. Next time I talked with Dan and Martha, I offered to do this for them. They agreed. That was in March. Their wedding was scheduled for May 30th. I started making signature blocks galore. I made over 400 of them knowing that was way more than needed. I wanted the attendees to be able to start over if mistakes were made. In that number I also cut 5 inch square white blocks for them to draw a picture if they wanted. Some of the pictures were quite detailed. Some chose to write verse. The kids loved that part and drew many pictures. All were incorporated into the quilt. Some were really creative. Some were especially endearing. Oh and Lorena and Elisa photo bombing the picture. They were our hangers. Thanks girls. Love you got into, too. Usually we only see their feet or their fingers. This picture shows the blocks I made for the signature. The blocks that have three fabrics - a color, a white and another color - were the signature blocks. The white 5" blocks was where they could sign, draw or be as creative as they wanted to be. It was fun to make. It was also the most pieced quilt I ever made. I wanted it to be big enough for them to use on a bed if they wanted to. It wound up to be 94" x 98". A special thank you to Martha's good friends who manned the signature table and provided the baskets to keep them in and the pens to write with. I really needed that assistance. I am glad you were there and so ready to assist. One was Janice Lawver. Here is the picture I included on the signature block I put on the back of the quilt. I usually sign my name, too. I forgot on this one. I guess they know who I am without it. 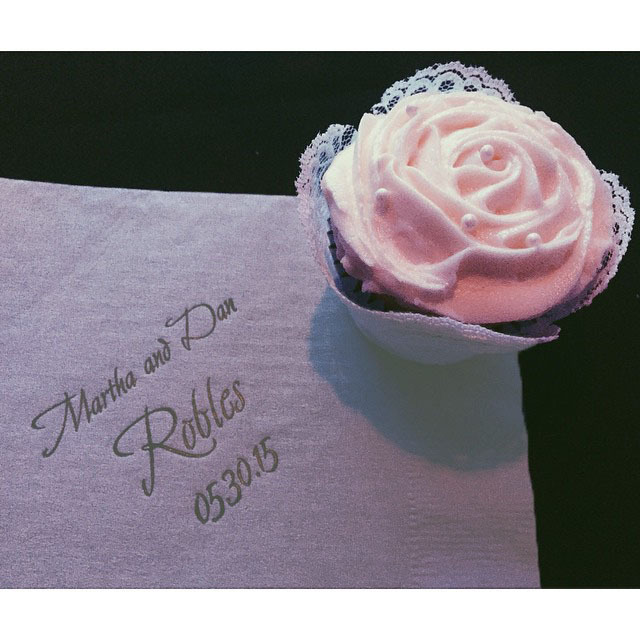 I liked it because instead of a traditional cake, they had cupcakes. They were YUMMY! What a great wedding. To Dan and Martha, sorry it took me so long to finished the quilt. Thanks for giving me the opportunity to make it. It was really made with love. Mine, mine, mine. Can't wait to go to my next quilting class. My sewing machine will go in style!